Many landscape paintings come with not just fixtures and fittings, the elements which are necessarily in the view, such as fields, trees, mountains, buildings, and the sky, but with mobile extras: animals and people. Although a great many landscapes have been painted without so much as a cow or person in sight, such barren and depopulated landscapes can appear quite eery. 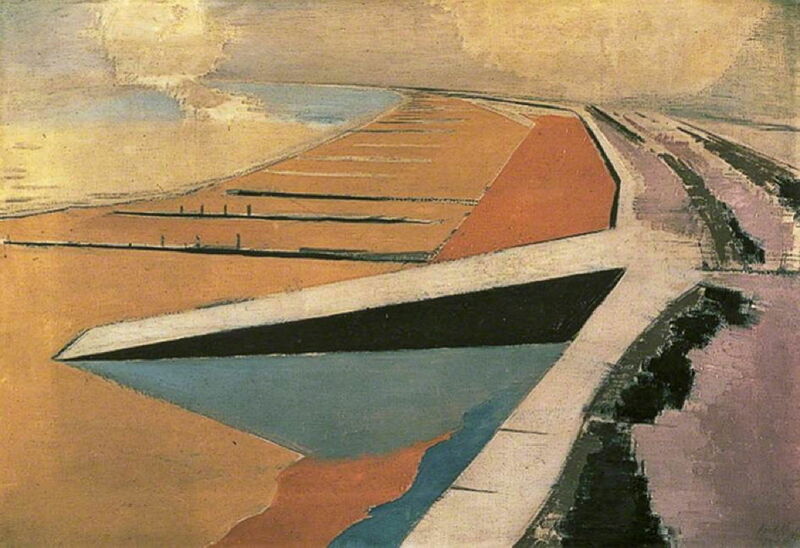 Paul Nash used depopulated landscapes extensively, or populated them not with the creatures that you’d expect to see, but symbolic objects, which eventually led to surrealism. Artists started populating their landscapes before they even made landscape paintings. 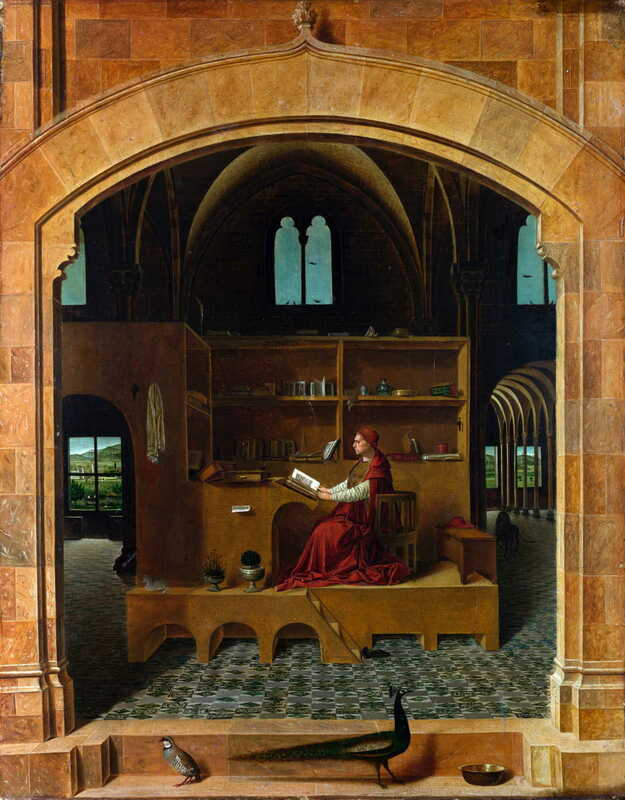 Look carefully in Antonello’s tiny vignette landscapes through the windows of Saint Jerome’s study, and you’ll see figures in a boat on a lake, another apparently on horseback, and some sheep. When the first proper landscape paintings started to appear, it is hard to know whether they were about the landscape shown, or the figures shown within it. 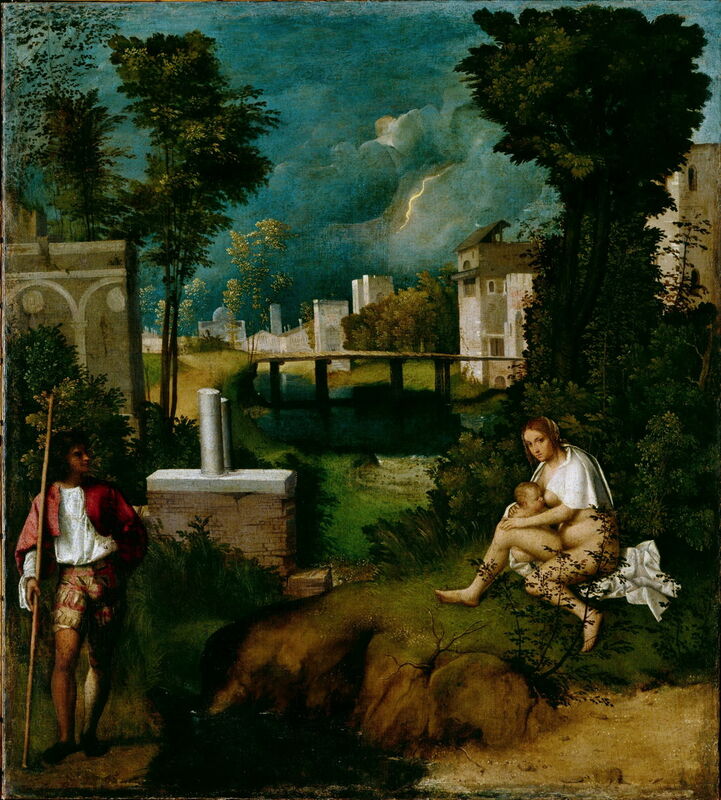 Giorgione’s revolutionary painting of The Tempest from just after 1500 has long puzzled viewers. Is there some narrative involving the mother nursing her infant at the breast and the rather fashionable young soldier stood on the opposite bank of the stream, or are they just elaborate staffage? That is a question which recurs when looking at so many landscapes with figures. There are many landscape paintings which come with stories attached. 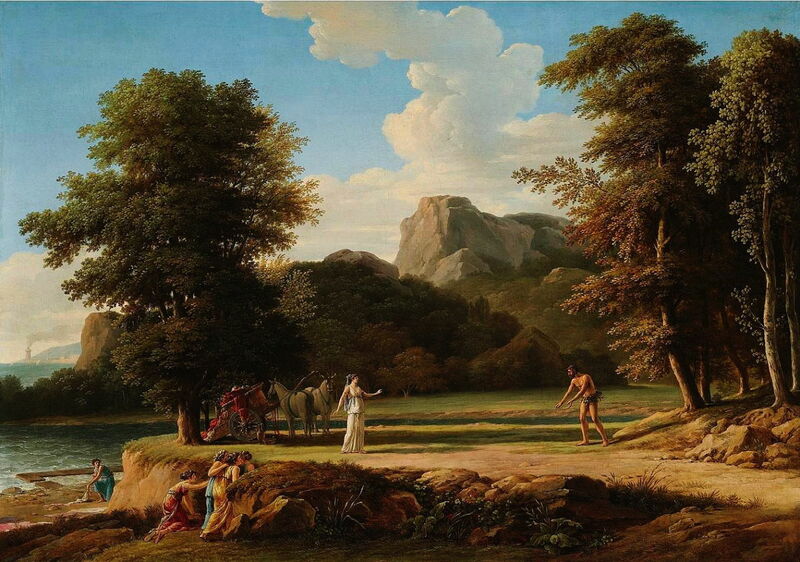 Poussin and other early landscape specialists frequently set figures from a narrative against their landscapes. So long as you recognise the characters and they match a familiar story, this works well. Valenciennes’ depiction of the story of Ulysses and Nausicaä, above, is a particularly clear and late example. Even if you don’t recognise the characters or story, it would be perverse to assume that such a deliberate arrangement of figures would not be a narrative waiting to be discovered. But sometimes painters deliberately bury their narrative, giving us the absolute minimum of clues. Pieter Brueghel the Elder’s splendid account of the fall of Icarus could easily elude the viewer: its only real clues are the shepherd stood in the middle of the painting looking up to the top left corner of the canvas, where there is nothing to be seen, and a pair of legs kicking in the water just below the stern of the ship at the right, with some feathers floating down above them. The legs are those of Icarus, who has flown too close to the sun, the wax holding his wings together has melted, and he has plunged into the sea. 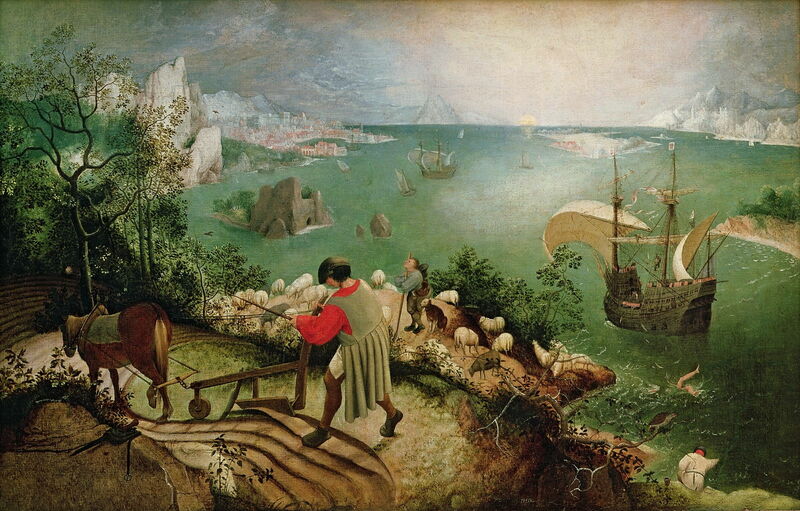 The shepherd is looking in wonderment at his father, who is still flying, but off the view (in another version by Joos de Momper, both Daedalus and Icarus are shown still in flight). Frédéric Bazille (1841–1870), Summer Scene (Bathers) (1869-70), oil on canvas, 160 × 160.7 cm, Fogg Art Museum, Harvard University, Cambridge, MA. Wikimedia Commons. 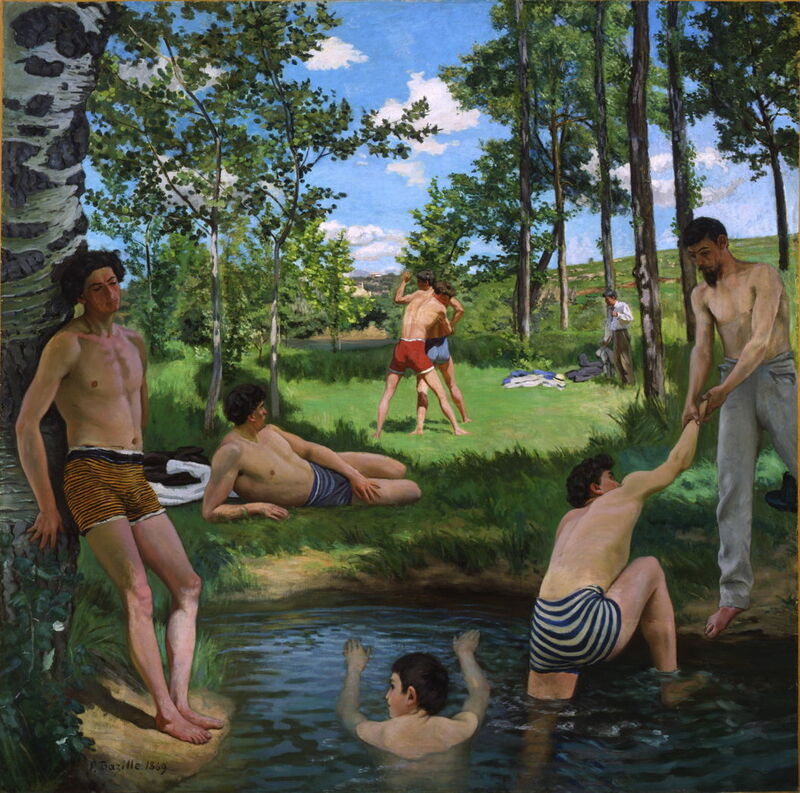 There are also plenty of primarily non-narrative figurative paintings in which a landscape is a backdrop, as in Bazille’s Summer Scene, which may have been a prototype for many later Impressionist paintings of bathers. In this case, the figures dominate the landscape in composition and size, but that is not always the case. 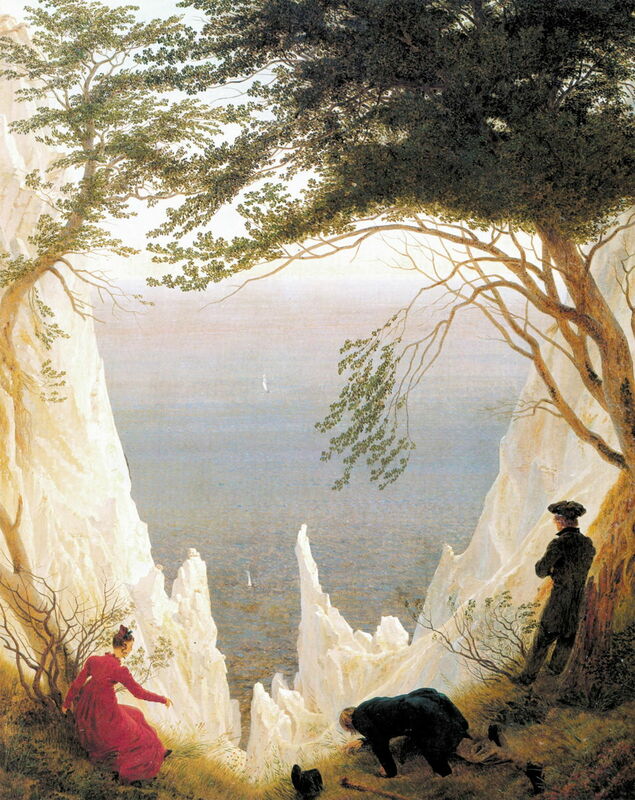 There many paintings, including those by Caspar David Friedrich, in which the balance between figures and landscape is far more difficult to judge, and may depend on your reading of the painting as a whole. The title of the painting suggests that the landscape might be dominant here, in which case the figures are mysterious, or the reading may actually need to start from examination of the figures and their likely identities: in this case the artist and his newly-married wife on their honeymoon. The third figure is open to speculation. Whether figures are added to a painting to alter its reading can be impossible to determine. 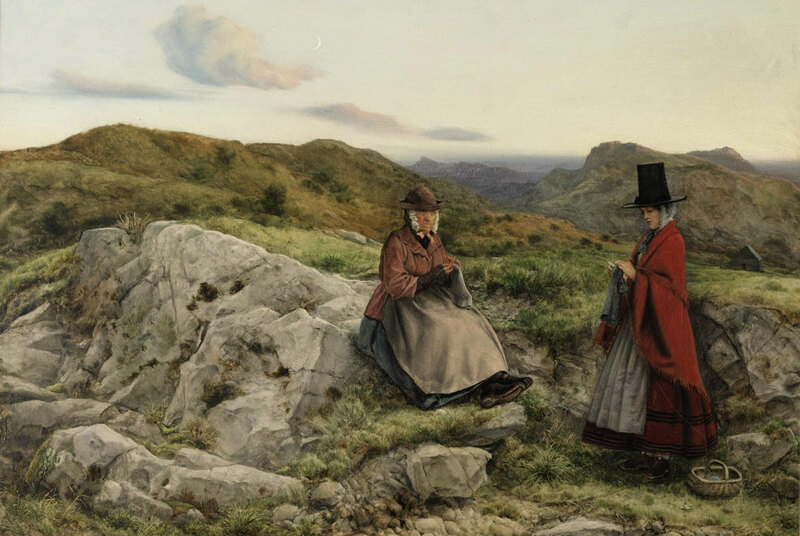 Superficially, you could assume that the two women in Welsh dress in William Dyce’s Welsh Landscape with Two Women Knitting are simply there to tell the viewer that this is Welsh countryside. But they are completely out of place, and dressed for show not knitting on the hillside. I have yet to see a satisfactory explanation as to how this painting might be read. There are also many landscape paintings in which the sheer number and complexity of the figures overwhelms the landscape in which they are depicted. Hendrick Avercamp (1585–1634), Winter Landscape with Skaters (1608), oil on panel, 77.3 x 131.9 cm, Rijksmuseum Amsterdam, Amsterdam, The Netherlands. Wikimedia Commons. 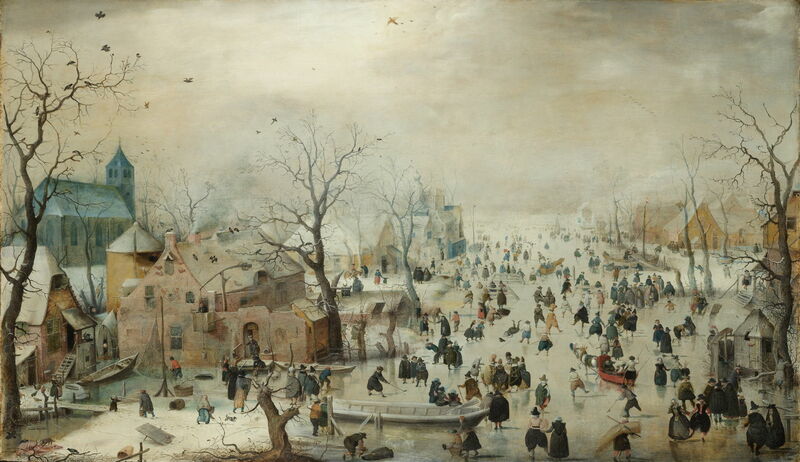 Like many of the Dutch paintings of winter scenes on frozen rivers, Avercamp’s Winter Landscape with Skaters could be more appropriately titled Skaters with Winter Landscape as its countless people form a figurescape. The same is true of many cityscapes painted in crowded parts of Paris and New York from the late nineteenth century onwards. In spite of these difficulties, there are plenty of landscapes and their creators in which the figures work with the fixtures and fittings of nature (and man) to create a coherent whole. 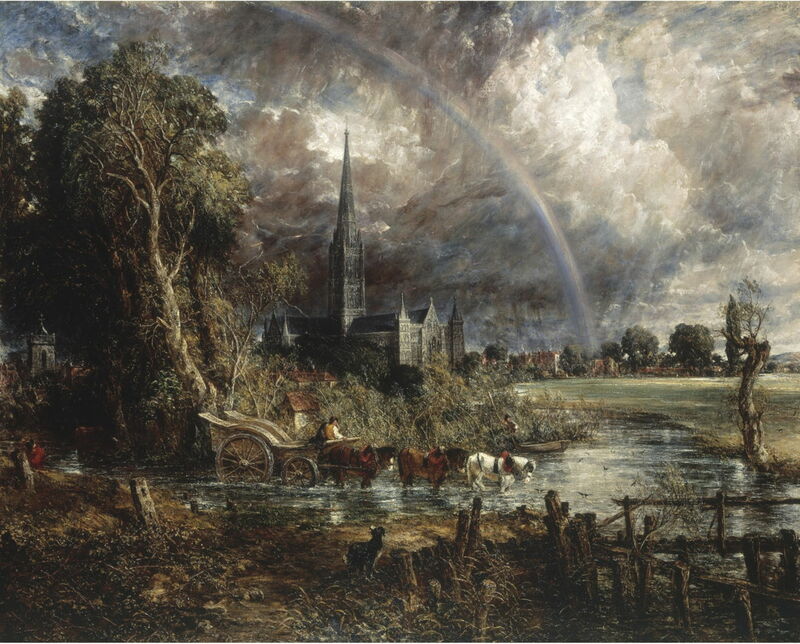 In many of Constable’s landscapes, the wagons and people are very definitely a part of the view, and as characteristic of the artist as their signature. To my great surprise, when researching this series I have been unable to discover any systematic study of the use of figures in landscape painting. Its articles will therefore proceed somewhat unsystematically, in the hope that, over time, consistent themes and coherence will emerge. I am looking forward to the journey, and hope that you will enjoy it with me. Posted in General, Painting and tagged Antonello, Avercamp, Bazille, Bruegel, Brueghel, Constable, Dyce, figures, Friedrich, Giorgione, landscape, Nash, painting, Valenciennes. Bookmark the permalink.